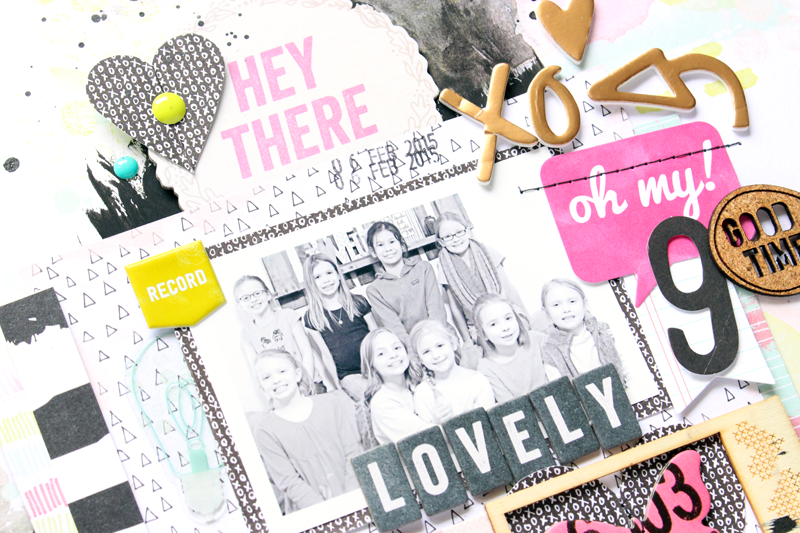 Today I have not one, but two layouts to share with you for Hip Kit Club!! 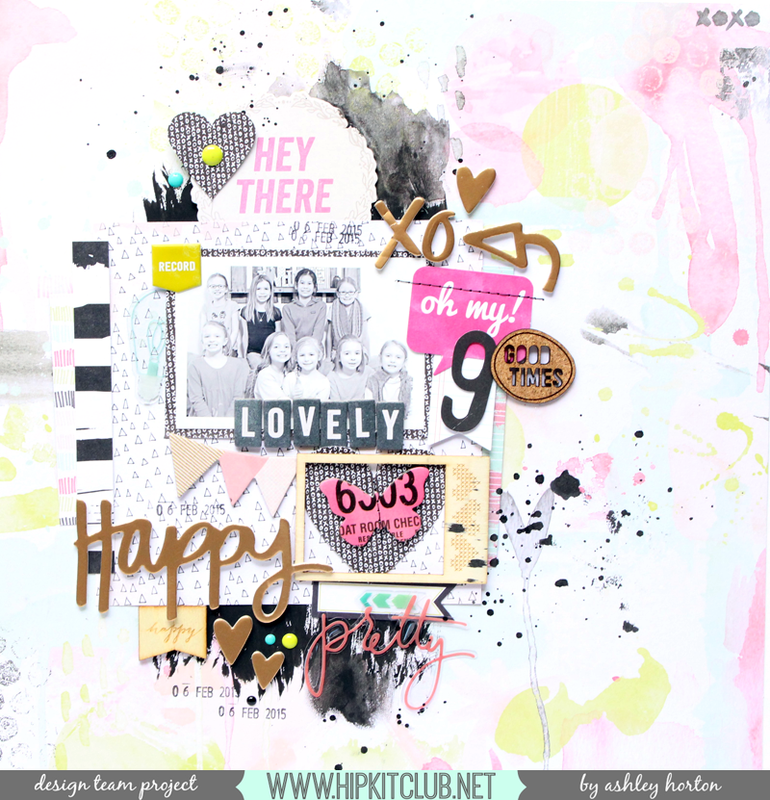 I thought it would be fun to do something a little bit different this week, so I mixed in a few items that I had left in my January 2015 Hip Kit and some Thickers from the December 2014 Hip Kit. I love how the products fit so easily together and you can extend the life of your kits, by mixing in previous Kits. I started this layout by cutting frames from the WRMK patterned paper and the Webster’s Pages patterned paper and layering them over White cardstock. Once I had the two patterned papers in place, I used the heart stencil from the January Kit, to add a spray misted heart design on the White cardstock. 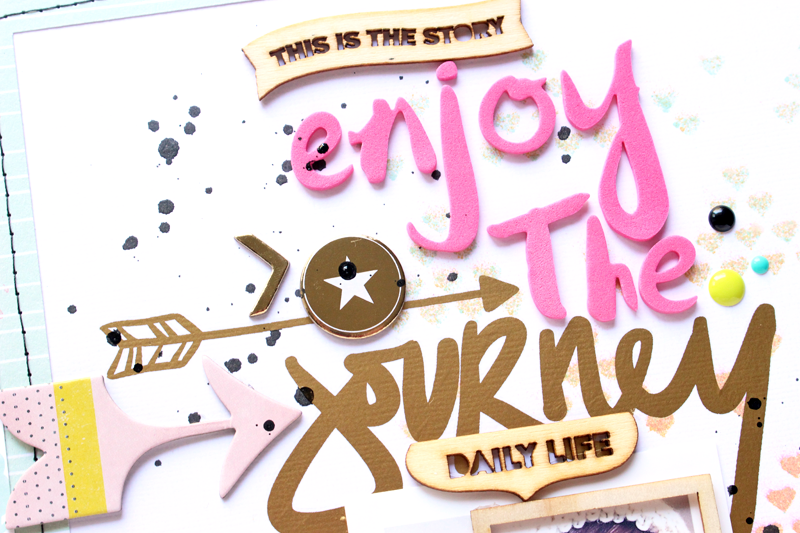 I wanted to create a large title on my layout, using the American Crafts Thickers and Journey rub-on from the My Mind’s Eye rub-on pack. I embellished using a mix of the Crate Paper Chipboard, Evalicious Wood Veneers and My Mind’s Eye Enamel Dots and then pulled in some of the Heidi Swapp Ephemera and the Wood Veneer Frame from the January 2015 Hip Kits. 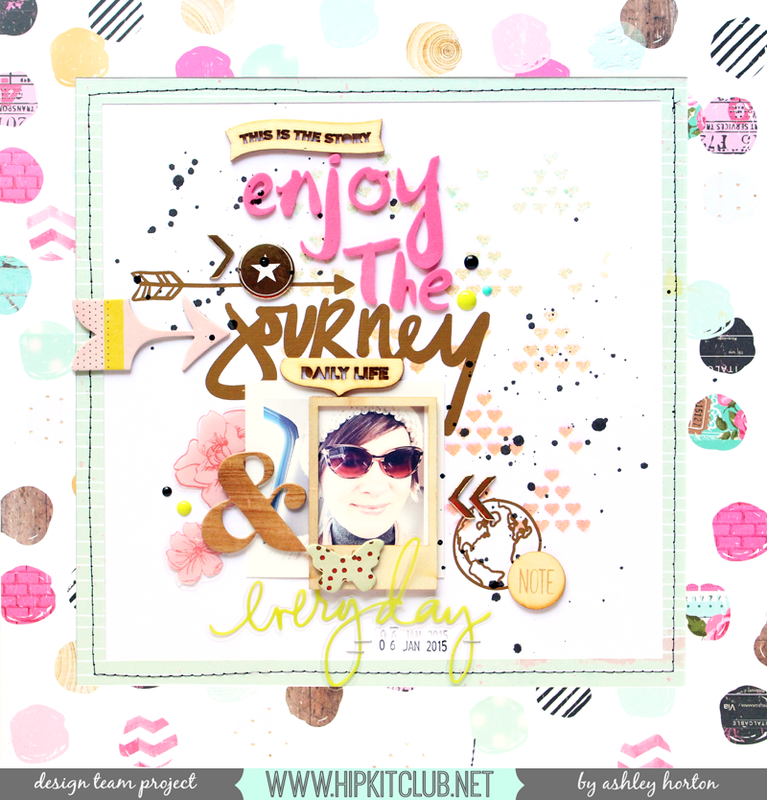 For this second layout, I wanted to create a lot of layering and a faux Mixed Media look. The WRMK Secret Crush patterned paper gives you an instant water color look, without having to put a lot of work into it. But I did want to separate my layers and photo from the background paper, so before I added my elements, I added some Black water color paint to the background. Then I built my layers, using some of the papers from the WRMK 6×6 Paper Pad included in the February 2015 Embellishment Kit. 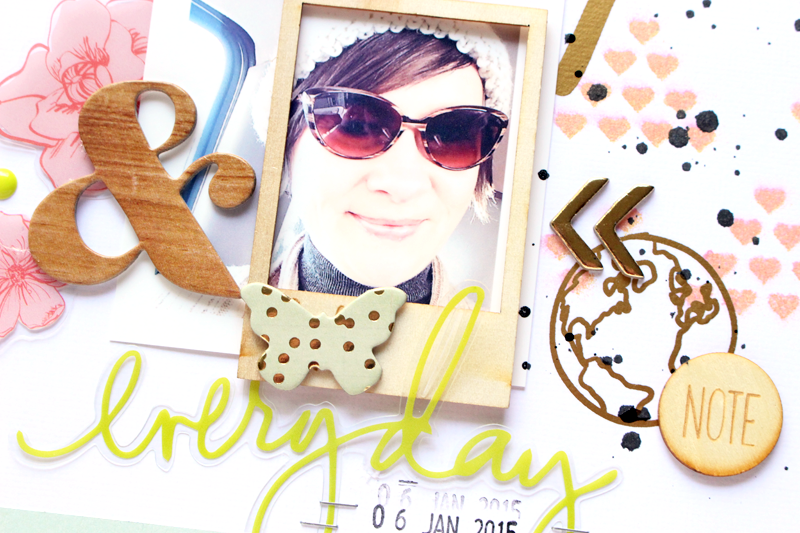 To finish my layout I used a few more of the Heidi Swapp Ephemera pieces, Wood Veneer Frame and Elle’s Studio Cork Embellishment from the January 2015 Hip Kits. 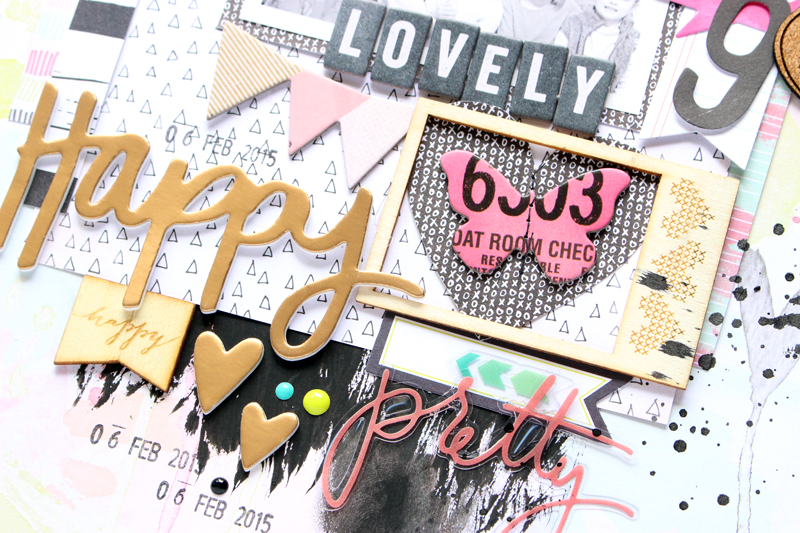 They worked great with the Crate Paper Chipboard, Evalicious Wood Veneers and My Mind’s Eye Enamel Dots, included in the February 2015 Hip Kits! And the American Crafts Dear Lizzy Thickers from the December 2014 Hip Kit, were perfect for adding a little touch of Gold to my layout! I also created a Process Video for this second layout, if you would like to check it out!! Soon you'll be seeing projects with the March 2015 Hip Kit & Add-On Kits, so be on the look out for those!